Tethered sow in Uganda (photo credit: ILRI/Kristina Rösel). ‘African swine fever (ASF) is one of the major constraints to the productivity of the pig enterprise in [Uganda]. 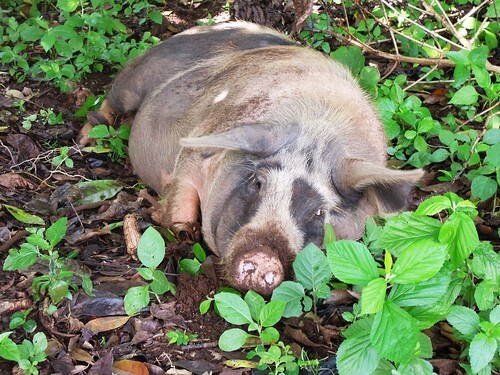 ‘For the average smallholder pig farmer in Uganda, rumours about a fever afflicting their animals often stirs worry and anxiety, according to the . . . . CGIAR Research Programme on Livestock and Fish. ‘Any form of fever in pigs has for long been associated with African swine fever (ASF), or ‘omusujja gwe’mbizzi’ as it is locally known. With its high infection and mortality rates, ASF can wipe out entire pig herds within a few days causing loss of income and threatening household food security. I had nine pigs, one of the sows had just littered but when swine fever broke out, I was left with just two piglets,” says Prossy Nayiga, a pig farmer in Masaka, Uganda. ‘Much of the research efforts to understand the dynamics of how ASF spreads in pigs has focused on producers, even though there is evidence that actions by other actors in the pig value chain especially traders, transporters and butchers also play a role in spreading the disease. The International Livestock Research Institute (ILRI) recently brought together pig value chain actors in Masaka District to review and identify measures of preventing the spread of ASF. ‘As part of this week-long (from 29 September to 3 October 2014) exercise, the ILRI Uganda team, led by Michel Dione, held key informant interviews with local government officials, the veterinary department, local councils and executive committee members of pig cooperatives in Masaka. . . .
‘Among the major ASF control constraints identified by the stakeholders were: limited knowledge about the disease and its epidemiology, weak policies on disease surveillance and regulation and the lack of a centralised slaughter areas at both parish and district levels. ‘Participants recommended the adoption of proper housing structures and farm fencing, use of disinfectants (in footbaths) for farm visitors and establishment of centralised slaughter areas with proper waste disposal facilities as part of the feasible protective measures to be implemented in the short and medium terms. ‘The ILRI pig value chain team in Uganda will conduct a similar exercise with stakeholders in Lira District in the north of the country. Read the whole article at the The Pig Site: Uganda fights African swine fever, 4 Nov 2014. Tags: Michel Dione, The Pig Site. Bookmark the permalink.